Our guest residence is designed to provide you with a peaceful and soothing respite from the outside world. The first floor includes a kitchen, living room with fold out queen-sized futon, bathroom, and first floor bedroom. Upstairs is a spacious bedroom, with a comfortable sitting area and a queen-sized bed. With two bedrooms and three beds, we can easily accommodate three to six guests. 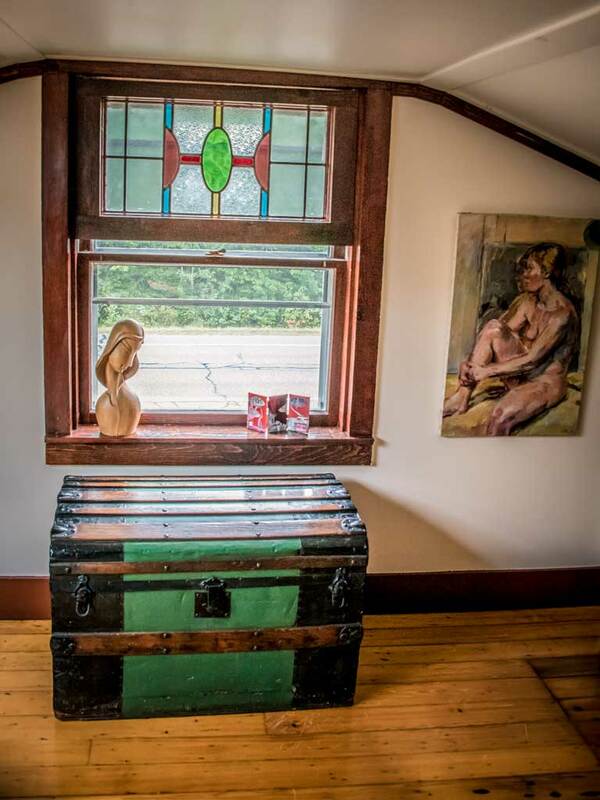 The apartment is exquisitely decorated with antique fretwork, stained glass, and lovingly re-purposed art and fixtures. A skylight frames the natural art of the universe so our guests can enjoy the natural light of day, and the beauty of the New England night sky. Conveniences include: A fully equipped kitchen with a dorm sized refrigerator, air conditioners and fans, flat-screen TV, wireless internet, cell phone service for most providers, quality linens, iron and ironing board, and hair dryer. Richard is happy to assist in making your stay as enjoyable as possible and to provide you with information on the surrounding area, activities and points of interest. 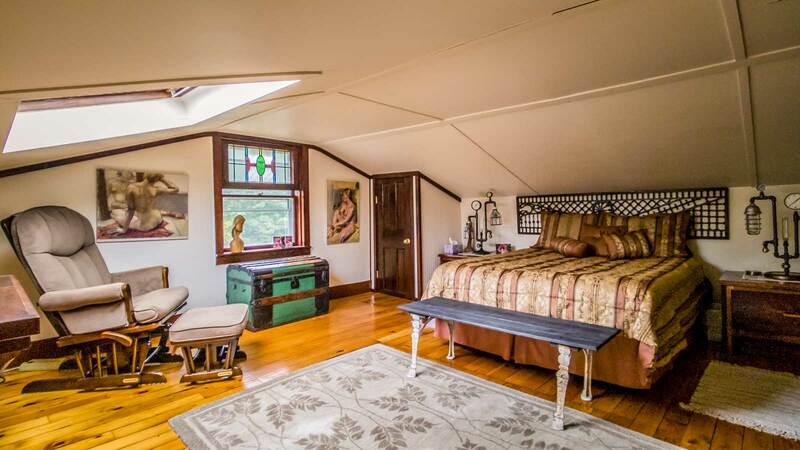 Three Sisters Sanctuary is situated just 30 minutes from downtown Northampton in one direction and 30 minutes from the Berkshires in the other with iconic, small New England towns in between. 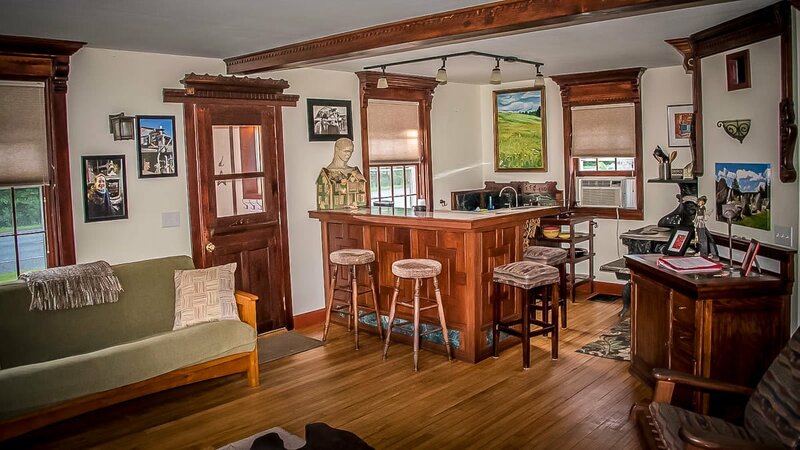 Our beautiful, artistic, one-of-a kind two story country retreat is a private apartment that sleeps 3-6 people with two bedrooms/three beds. The Sanctuary encompasses 8-acres of tranquil, enchanting healing gardens filled with art installations. It’s truly a unique space where art and nature merge. The owner-artist designed and hand-crafted this space in the Arts and Crafts tradition, re-purposing architectural components from old buildings. It consists of a two-bedroom, two-story apartment with private entrances, attached to the owner’s home. The first floor includes a period kitchen, living room with fold out queen-sized futon, bathroom and first floor bedroom. The second floor consists of a spacious bedroom and sitting area furnished with a queen-sized bed with soft linens. The decorative features of this bedroom include antique fretwork, interesting art, stained glass, and a skylight that frames the stars. Apartment conveniences include: flat-screen TV, wireless internet, and cell phone service for most providers. Kitchen is fully-equipped. For those planning to cook please note the refrigerator is a dorm size. Window air conditioners and fans, as needed seasonally. Iron and ironing board, hair dryer. Quality linens included in rent. Three Sisters Sanctuary is intended as a place of healing and inspiration. It consists of seven outdoor “rooms”, which include over 200 standing stones, water gardens, sculpture, the Dragon’s Den, and a stone amphitheater. The Sanctuary is also a venue for sharing the creative arts and special events and can be rented in tandem with the rental space. 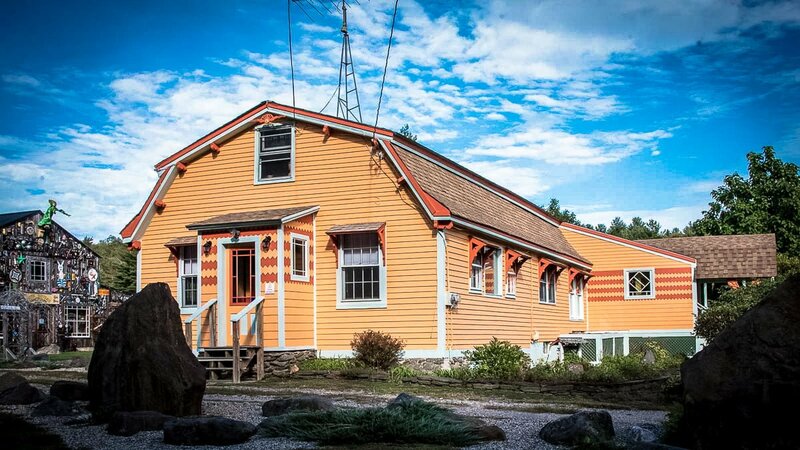 Good Times Stove Company, New England’s largest stove museum and showroom, is also located on the property. 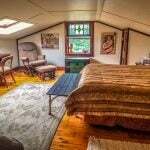 The Sanctuary is conveniently located near several hubs of arts, culture, and adventure between the Pioneer Valley and the Berkshires, and is the perfect place to stop on a trip to Vermont for skiing or sightseeing. Northampton (the “5 College” area) and scenic Shelburne Falls are an easy 20-25 minute drive away, and a trip to the expansive Mass MoCA art museum takes just over half an hour. Quaint country downtown centers and general stores abound in the immediate area. In addition to the sanctuary, guests will want to explore the abutting 3500-acre conservation area which provides walking trails and a peaceful lake. This space can be enjoyed in all four seasons. Your experience here is meant to be inspirational, reconnecting you to art, nature and the joy of life. There are bicycles available for loan. The space is located within 10 to 30 minutes of the Five College Region (Northampton (Smith College) Amherst (Amherst and Hampshire College, University of Massachusetts at Amherst) and South Hadley (Mount Holyoke College) This area of Western Massachusetts is rich with a myriad of museums, music venues, theaters and countless other cultural and educational opportunities. Outdoor adventure abounds with zip lies, river rafting, ski resorts, hiking, biking and so much more.